The Arsenal of Freedom has a very ‘classic’ Trek feel, and this episode is a great ensemble piece for TNG. There’s more will-they-won’t-they for Picard and Beverly, Geordi is in charge of the Enterprise, and perhaps most worrying of all: Troi actually counsels someone. Episode synopsis: 11th April 1988. 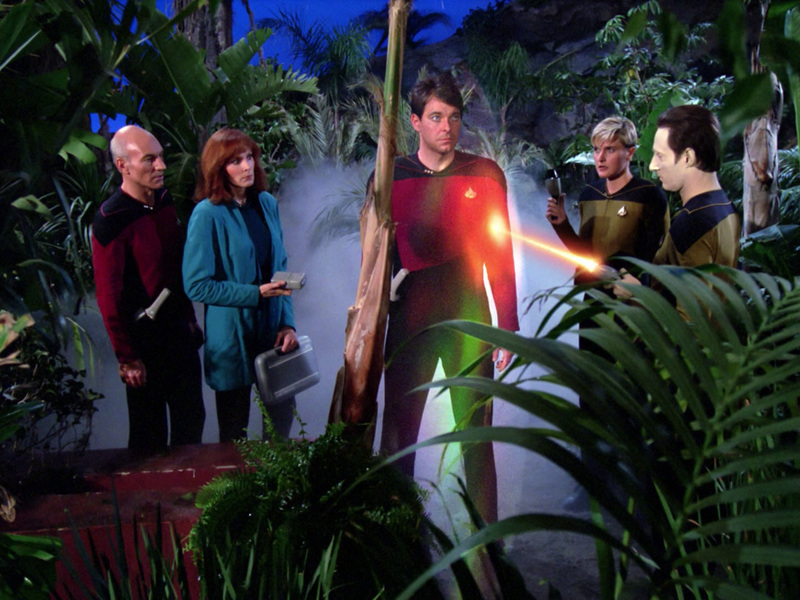 Posted in Season 1, TNGTagged AI, Beverly, Data, Drones, Picard, Riker, Tasha, WeaponsBookmark the permalink. Just want to say, love what you’re doing! I’ve been on the lookout for a good TNG re-watch commentary/podcast for years and I was so happy when I finally found this. What’s more, to my delight you guys are fellow Brits, not that I have anything against Americans but it’s a nice change to hear from a British perspective when commentary is normally entirely dominated by yanks! New to your podcast and I absolutely love it! You both give great insight to the episodes and the scientific information adds a lot! Tons of fun too! I just listened to this episode and your comments about the Minos salesman and the actor Vincent Schiavelli and how he shows up as the bad guy or creepy guy and sure enough, James Bond film Tomorrow Never Dies was on today and guess who shows up as creepy hired assassin? Haha I laughed out loud! Keep up the good work!